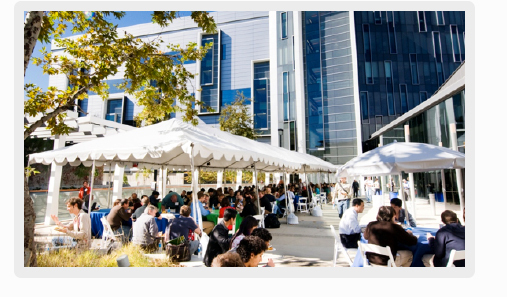 The Engineering Courtyard is an outdoor event space useful for large receptions and meals for conferences. It can also be used as an overflow area for larger events needing more reception space for outside events. The Engineering Courtyard is part of the shared space referred to as the Engineering Quad. All events must be approved in collaboration with the Jacobs School of Engineering. The Pre-Function Area (PFA) is an open, naturally-lit gathering space with direct access to the Calit2 Auditorium and Calit2 Theater. 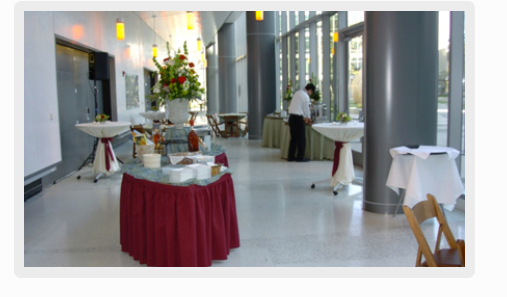 With a seating capacity of 80-100 or standing room capacity of 150-200, the PFA is most commonly used for receptions before and after events, or meals during conferences. The Qualcomm Institute’s advanced HD video production facility supplies visual content for scientific, artistic and communications purposes. The facility consists of five spaces for video editing, audio booth, machine room and full-scale live and/or recorded studio shoots and more. The Main Studio is equipped with one Professional JVC GY-HD250 studio camera, two Sony BRC-H700 HD Pan-Tilt-Zoom cameras, a Sony HXRNX5U camcorder, one Sony PXWZ100 4K camcorder, and two Panasonic 55-inch plasma displays. Audio equipment includes 7 Shure MX185 Microflex Lavaliers, ClearOne Intercom, JBL Playback speakers, AKG C1000 Condenser mics, etc. Lighting fixtures include 6 Brightline SeriesOnes with honeycomb filters, 4 Arri Arrilite 1000s, an 8-pod Elation Octopod 80 Alkalite LED system, and 9 ETC Source Four Ellipsoidals and PARNELs with barndoors. Other equipment includes Manfrotto and Libec tripods, ULTRALITE Teleprompter, VariZoom FlowCam DV Sportster steadicam, and a Green Screen system. Other rooms in the HD Production Facility include a Control Room for real-time, live-switching program recording; a Server Room, for recording/playback, quality control and videoconferencing; an Audio Booth for voice-over recording, and an Editing suite for HD/4K post production services. 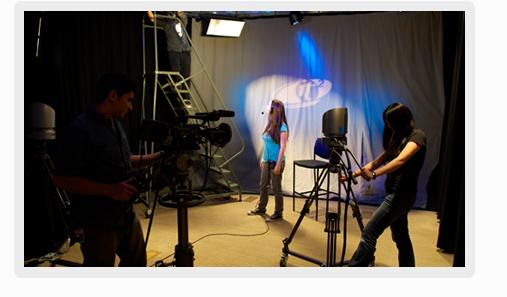 More information on the HD Studio’s capabilities can be viewed here. The SunCAVE (an upgrade of the previous StarCAVE) is a 360-degree, virtual reality space outfitted with 70 3D stereo ultra-high definition 4K panels (45 screens in front and another 25 behind) driven by 70 Nvidia 1080 GPUs. The 500 megapixel display tilts at both the top and the bottom for an encompassing experience that gives the space a sphere-like appearance. Wearing lightweight passive glasses, visitors can interactively engage with presentation through the use of an ART optical tracking system. The Immersive Visualization Lab (IVL) is home to a number of advanced virtual-reality devices, some of them still in development. The StarCAVE 360-degree, virtual reality environment is the principal system of potential use by artists seeking to showcase 3D VR multimedia. 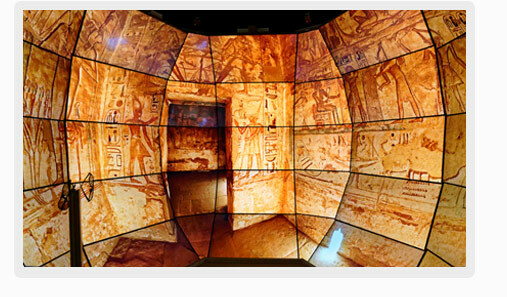 The room operates at a combined resolution of over 68 million pixels - 34 million per eye - distributed over 15 rear-projected walls and two floor screens. 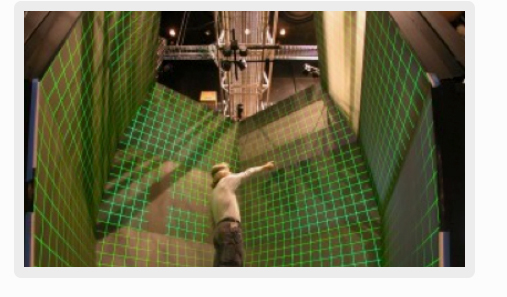 Each side of the pentagon-shaped room has three stacked screens, with the bottom and top screens titled inward by 15 degrees to increase the feeling of immersion (while also reducing the ghosting, or ‘seeing double’, that bedevils VR systems). Visuals are rear-projected on each screen with two HD projectors to permit HD in 3D. Two separate projectors beam 3D imagery on the room’s floor. Each pair of projectors is powered by a high-end, quad-core PC running on Linux, with dual graphics processing units and dual network cards to achieve gigabit Ethernet or 10GigE networking. Thus, the StarCAVE supports 20/40 vision and the images are very high contrast, thanks to the room’s unique shape and special screens that allow viewers to use 3D polarizing glasses. Adding to the virtual reality in the StarCAVE is the surround sound system, which harnesses recent advances in wave field synthesis – a way to maximize the perception of many channels of sound emanating from different sides of the room. Calit2 also worked closely with Meyer Sound, Inc., to customize the installation of three arrays of five conventional high-quality speakers to provide 5.1 surround sound or up to 15 channels of discreet audio diffusion (with a subwoofer channel built into the floor structure). 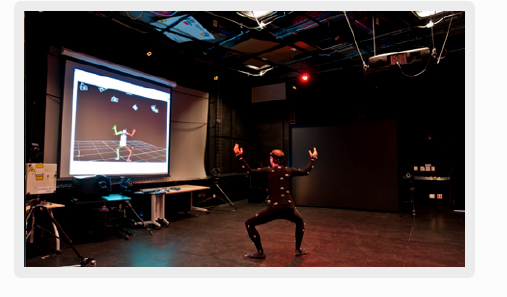 The Recombinant Media Lab includes several black-box spaces that can be used to display 360-degree participative work. For an example, a Surround Cinema exhibition featured a 10-screen, 10-projector design, featuring 10-channel audio and lots of speakers. For samples, visit vimeo.com/5157529 or vimeo.com/5176316. The Media Technology Resources (MTR) team is the only group authorized to provide Audio-Visual support for the activities taking place in Atkinson Hall's public spaces. If you are organizing an event in the Calit2 Auditorium, a performance in the Calit2 Theater or any internal or external space around Atkinson Hall, please contact the MTR team for assistance well in advance. After gathering information about your technical needs, the team can provide an estimate of the equipment and labor costs related to a proposed event (for inclusion in your proposal). The Calit2 Auditorium is equipped with the latest Sony video technology and includes up to 4 remote-controlled Pan-Tilt-Zoom cameras, switched live for a more engaging experience, including screenshots of presentation materials. 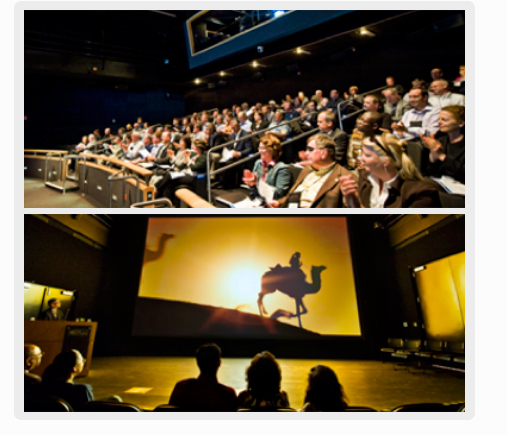 For all events that take place in the Calit2 Auditorium, the MTR team can provide HD video recording for later viewing, as well as real-time webcasting, offered for $50-$85 per hour plus editing time. 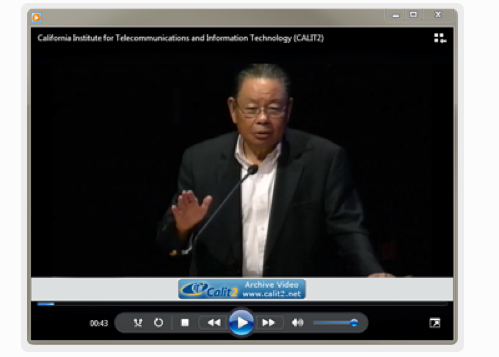 The Qualcomm Institute’s Media Technology Resources (MTR) group makes available equipment for use at Atkinson Hall events and related projects, in addition to the webcasting, videotaping and other a/v technical support referenced above. For equipment available, click here.